George Brooks began his remarkable career with a five year apprenticeship in his native Montreal, Canada. 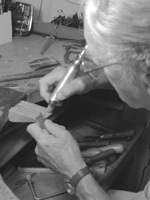 He became a master platinum worker and goldsmith working at the well-known Canadian jeweler, Henry Birks & Sons, and then as an apprentice to Georges Delrue, a contemporary jewelry designer. In 1957, he opened his own store in Montreal, and was one of the first, trained professional jewelers to break away from the Art Deco style popular at the time to experiment with what would later be called the Modernist style. He was also innovative in the application of silversmithing techniques — such as hammering and doming metal — to achieve fluid, three dimensional effects in 18k gold and platinum jewelry. Over the following 30+ years, George opened two successful jewelry stores in Santa Barbara, California, exclusively selling his own hand forged jewelry (no casting). He became one of the world's foremost authorities on opal, purchasing opals and gemstones directly from the source during semiannual buying trips to such exotic locations as Sri Lanka, Australia, Thailand, Hong Kong, and Zimbabwe. George's customers know him for his quality craftsmanship and unique designs. His work has been accepted into many permanent museum collections around the world, including the Smithsonian Institute's Renwick Gallery, located in Washington D.C.